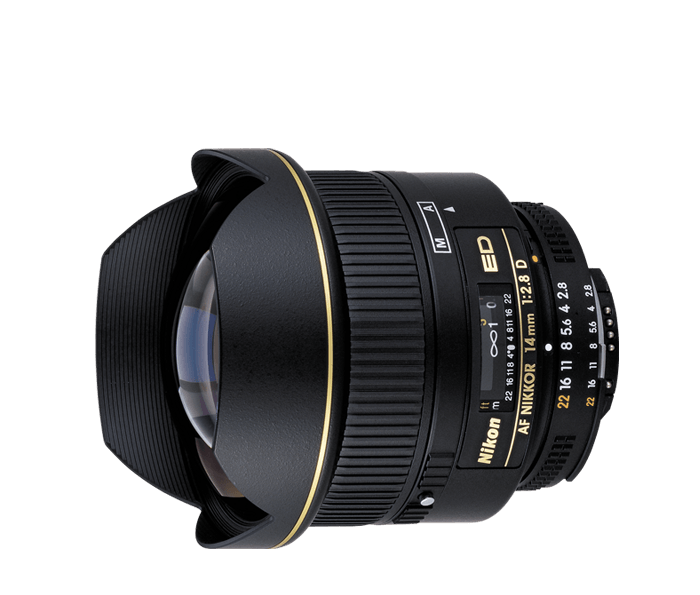 Fast, f/2.8 FX-format ultra-wide-angle prime lens. At 14mm, this advanced FX-format prime lens covers an extremely wide 114° angle of view, capturing a remarkably broad expanse with an exaggerated perspective. Its fast maximum aperture of f/2.8 creates beautiful background blur (bokeh) and is ideal for low-light shooting. The AF NIKKOR 14mm f/2.8D ED is a great choice for interiors, landscapes, cityscapes and more. With its fast f/2.8 aperture, the AF NIKKOR 14mm f/2.8D ED offers a compact, easy way to approach a broader range of shooting opportunities in low-light situations. Capture dramatic sunsets and cityscapes you never thought possible, or work in interior spaces without a flash. With its 114° picture angle on FX-format D-SLRs, the ultra-wide-angle AF NIKKOR 14mm f/2.8D ED offers a dramatic angle of view in demanding situations. Find exciting new viewpoints and perspecitves within ordinary settings. Expect exceptional results with every shot.